A great collection of 50 “standards” that you really need to know if you want to call yourself a guitarist! 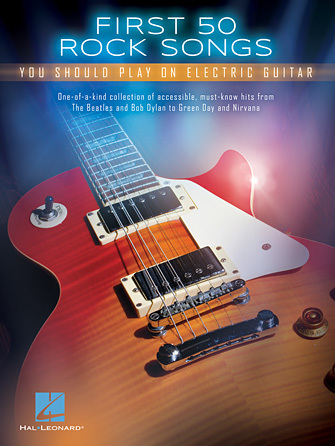 This book provides a combo of tab, chords and lyrics. Includes: All Along the Watchtower • Beat It • Born to Be Wild • Brown Eyed Girl • Cocaine • Communication Breakdown • Detroit Rock City • Hallelujah • (I Can't Get No) Satisfaction • Iron Man • Oh, Pretty Woman • Peter Gunn • Pride and Joy • Seven Nation Army • Should I Stay or Should I Go • Smells like Teen Spirit • Smoke on the Water • Sunshine of Your Love • When I Come Around • Wild Thing • You Really Got Me • and more.